Do you need to buy gifts for 4 year old girls? And you have no clue what to pick out? We’re here to help with some creative and imagination-inspiring suggestions! It can be really tough to know what gifts 4 year old girls will be thrilled to receive, but you CAN make some safe guesses. 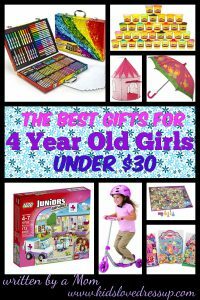 This post will share 10 gifts UNDER $30 that I’m pretty sure any little girl will love. First off, a four year old girl can never really have enough NEW art supplies. She might already have markers. She might already have crayons. But if the crayons are snapped or have the paper peeled and are just in a box somewhere, and if some of her markers that have dried out in her set… they aren’t REALLY amazing and fun anymore, for some reason. She will be THRILLED to replace them with “shiny new ones”. Trust me. Rated 4.8 out of 5 stars by over 550 reviewers at Amazon. There are very few 4 year old girls who haven’t watched and fallen in love with Disney’s Frozen. There’s just something about Elsa and Anna that little girls are drawn to… perhaps the lovely gowns, the magic, the cute side characters like Olaf & Sven, the innocent love story, the “sisters are best friends no matter what”? I think the pretty gowns have a LOT to do with it. On this “dress up” website, I’ve done a lot of research on kids dress up clothes, and even a few years later now since Frozen came out, Elsa and Anna costumes reign supreme for girls. There’s no competition! This particular set is a perfect gift: even comes in a pretty themed box! It comes with the items pictured, and will be a hit! 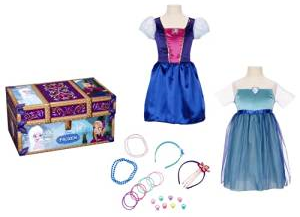 Check out my review of the Disney Frozen Travel Dress Up Trunk for way more details. Rated 4.1 out of 5 stars by over 645 reviewers at Amazon. 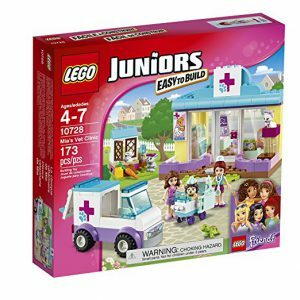 Lego is a classic gift that’s always appreciated… and these Lego Junior building kits are fantastic gifts for 4 year old girls (and older). Lego Junior is easier to put together and take apart than the classic stuff, so little fingers can work with the pieces without needing Dad and Mom’s help. The theme and building kit gives them a place to start with “what to make”. Rated 4.9 out of 5 stars by over 30 reviewers at Amazon (review of “Mia’s Vet Clinic” set). There’s just something so FUN about playing doctor and nurse (or veterinarian) for little girls around the age of 4! They just LOVE it!! It plays to their compassion, their sense of empathy and well-being, it allows them to be “in charge” and give directions… and to also be the sick character sometimes, which for some reason they find a lot of fun. This costume set includes the dress up coat and all of the gear needed to REALLY get into doctor play! 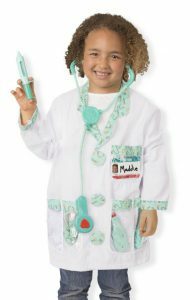 We personally have the Melissa and Doug Doctor Role Play Costume Set, and it’s top quality. It’s GREAT value for what you receive! Check out my review of it HERE to dig in a bit more. Spoiler alert: this is one of my favorite role play costume sets by Melissa and Doug (the other being the Fire Man set – reviewed HERE). Rated 4.8 out of 5 stars by over 585 reviewers on Amazon. Ask any little girl, especially those around 4 years old… they NEED and very much want their own umbrella. 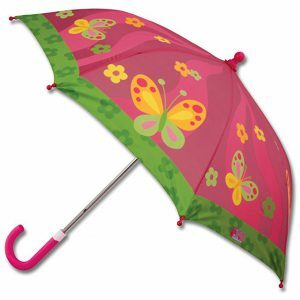 They are exciting to carry in the rain, fun to play with (even inside, where they become “princess parasols” pretty quickly), and I have yet to meet a 4 year old girl who prefers a standard issue black umbrella to a cute, girly one like this one. Rated 4.4 out of 5 stars by over 270 reviewers on Amazon. It’s around when their kids hit age 3-4 that parents start asking around for games they can play with their child. Candy Land is a common response, and I have to agree, it’s a great game for little kids! They can pick up the concept quickly, and it’s fun to follow the path to King Candy’s castle. THIS particular version appeals to lovers of Candyland, but also to Disney Princess lovers! 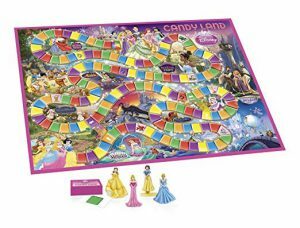 It’s the same Candy Land game, but the goal is to be the first princess to reach the castle to dance at the ball! There are 4 princess figurines (Belle, Aurora, Snow White, and Cinderella), and the game board is full of familiar scenes from Disney movies. She’ll love it! Rated 4.6 out of 5 stars by over 335 reviewers on Amazon. 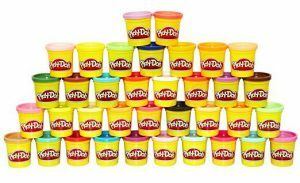 Play Doh – Mega Set! Play Doh is one of those gifts for 4 year old girls that will FOR SURE get played with. Often though, it’s not immediately, as a tub or two isn’t the most exciting thing, but it WILL ALWAYS be enjoyed. However, if you get her this incredible Play Doh Mega Set of 36 colors… she’ll be begging to get her hands on them right away and check out the fun variety of play doh she has now, literally at her fingertips! This is a set of 36 little jars. From reading the reviews, two things to be aware of before purchasing: there are not necessarily 36 different colors… there may be some doubles. (Honestly, this is ok. Kids like a bigger ball sometimes.) The other thing is that these are 3oz tubs, not the usual 5oz tubs you get at the dollar store. Still… it’s a lot of Play Doh! Rated 4.8 out of 5 stars by over 910 reviewers on Amazon. 4 year old girls LOVE stickers, on the whole. (I have yet to find a 4 year old girl who doesn’t LOVE them – and I’m deep into that world.) This particular set is a great gift for 4 year old girls – Sticker Activity books with REUSABLE stickers! These are great for traveling or for quiet times (many 4 year olds have a quiet time instead of a nap every day, so their moms will thank you for providing something fun she can do on her own in her room). 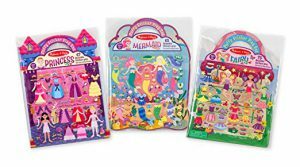 This set comes with 3 different packages, each with a girly theme: Princess, Mermaid, and Fairy. There are over 180 reusable stickers in total, meaning about 60 per set. In each set, there are clothing and accessory item stickers as well as “set the scene” stickers. Lots of fun to be had! Rated 4.5 out of 5 stars by over 160 reviewers on Amazon. Every princess needs her castle. 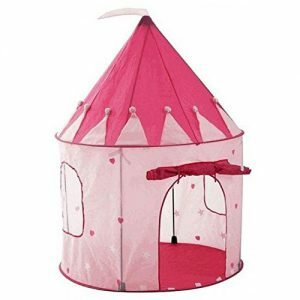 And this particular play princess tent is one fantastic castle! It’s good for both inside and outside play, has a strong fiberglass rod style ceiling so it’s not coming down on top of them, it even comes with glow in the dark stars! These are perfect for little kids – ours gets played with daily! It becomes a secret hide out, a book-nook, a home for stuffed animals, a castle in which they hide from “monsters”, and so much more! If you want to give a gift that inspires creative play, this is a great choice! Rated 4.4 out of 5 stars by over 1,475 reviewers on Amazon. Razor Jr. Lil’ Kick Scooter! 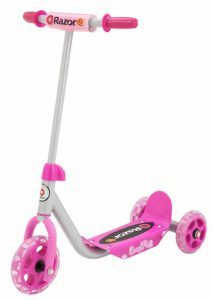 If the 4 year old you’re shopping for hasn’t mastered a two-wheeler bike yet (and she wouldn’t be alone in that AT ALL), then she may simply LOVE to own a scooter like this one! Scooters are easier for kids to figure out than bike riding, and they are tons of fun – and thus, really popular! Once you start to look for them, you’ll see kids on them everywhere! This particular choice of scooter is slightly easier for little kids to master than others, as it’s a three-wheeled scooter. (Other scooters have two wheels.) It has a wide base, and is thus much less wobbly. Meaning, she’ll feel more secure on it, can put both feet side by side on the platform if she wants to, and she won’t topple so quickly. I’d highly recommend (from experience with my daughter and her scooter) that you go with a three-wheeled scooter for this age! Rated 4.2 out of 5 stars by over 1,000 reviewers on Amazon. Like what you see? Feel free to drop me a line below and let me know if my 10 choices for gifts for 4 year old girls was helpful for you! Have questions or suggestions? I’d love to hear from you! I would certainly love the Crayola set if I was a kid again! There is something irresistible about a set of something in different colors all lined up! The colors and choices are enough to get anyone feeling creative no matter what our age! I also loved umbrellas as a girl…I really don’t know why but there is something fun about umbrellas! The scooter would be great also! Umbrellas may seem like a funny choice for “top gifts” to some, so I’m so glad you agree with me that there’s something really special about them for little girls! I appreciate the comment, thanks! Have a great day! Hi Kiki, So glad you found this post helpful! And yes, I’m certain your niece would love the Frozen Travel Dress Up Trunk! I think these are great ideas. My favorites on your list are the crayola art case, the umbrella, and the scooter. My 11 year old always loved her own umbrella when she was younger. I think it makes them feel grown up that they have their own. And all kids love riding toys so you can’t go wrong there! Thanks Jen! 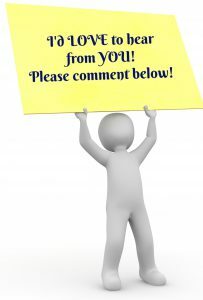 I appreciate your taking the time to comment! I agree that kids just LOVE riding toys! I think the scooter is one of my fave pics on this list too. I sure would rather my own children keep that love of physical fun and have a blast with a scooter than get sucked into screen games! Marlaine, I love the Crayola, as other posters! 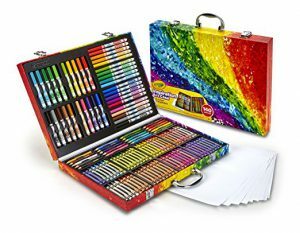 I have an 8 year old niece who loves coloring and drawing, and this is a gift she would absolutely adore…Mind you she would probably love the case as much as the contents! Crayons are ageless, that’s for sure! I’m in my mid 30s and I’d still love getting this case and having fun coloring along with my daughter LOL. Glad you liked the post, and thanks for commenting! Hi there these are absolutely great gift ideas the best part they cost less than $30. My little sister will be happy to have the princess castle I like it too lol. Thanks for sharing and have a great day, another amazing post Marlaine! Thanks Anis! I like that we can find great gifts for great prices! Who says you have to spend a ton of money to get something that will be a huge hit!? Wow these are awesome options for a 4 year old girl. The The Crayola Inspiration Art Case and the tent are the best options I liked and will visit here again to buy them. Thank you for your excellent ideas for little girls gift. You saved a lot of time and confusion for me. Keep up the good work. It was a lot of fun gathering these ideas, and my little girl approves them, so I’m hoping yours will love them too! Thanks for commenting, and I’m so glad you liked this post, Jed! Oh my god, so many great ideas. As I scrolled down, I just got more and more excited. From the Crayola Inspiration Art Case, Frozen travel trunk, umbrella, and Play-Doh, I can’t go wrong. I know she will be especially excited about the Candy Land Princess addition as the original is already a big hit already in our household. Combine it with princess’s and we have a winner! Thanks as always for the great ideas. You keep doing all the hard work for me. Patrick, I’m glad you are finding stuff here at kidslovedressup.com that your daughter will love! It’s always my aim to provide great ideas for parents to help their kids get the most out of dress up and other fun! Have a lovely day. I love the reviews and products. what wonderful ideas for gifts. Art supplies are still a big deal with my 11 year old. We both love to draw and paint. It was a great gift for her for sure. This is a wonderful site. Thank you for your efforts. Thanks so much for taking the time to write in, Wendy! I’m glad you found these ideas to be sound! Have a great day.